I don;t clean the jewelry. but will need a good cleaning. you will see different sizes and styles. One pin is cellul oid with a lady bug on it. 2 sets flo wer pins with matching earrings. 4 pair s of flower earrings. 13 flowers pins. The red &pink rhinestone earrings are plastic. Very nice lot. Mark: Unsigned, 10 pieces, 8 brooches, 2 with matching earrings. Just gorgeous! My bracelets are fully loaded with individually handcrafted charms created from the hundreds of highest quality beads, crystals and brass findings. My Blue Jean Baby bracelet charms include gorgeous translucent sapphire blue lampwork beads with encased light blue and white double bloom flowers and pale sea green accent vines. Vintage & new mix color style necklace lot #2093 genuine stone 925 ?? 7 vtg new mix color style necklace lot. Pastel Pink Enamel Hoop Pierced Earrings 1"
These are pierced earrings. Jewelry Type: Pierced Earrings. Beveled hoop earrings. Color: Pink. Clasp Type: No Clasp. MAKE SURE YOU ARE SELECTING THE RIGHT SIZE AND COLOR. WE ARE ALWAYS HAPPY TO HELP. CREATING YOUR OWN JEWELRY DESIGNS. JJ pins, broaches, tac pins, plates, letter openers. Every pin is signed and very detailed. The pin you will receive is shown above and although. and is in new condition never removed from the card. MIRIAM HASKELL NECKLACE. 1 first tray signed. BSK BROOCHE. ALL EARRINGS HAVE BEEN PROFESSIONALLY CLEANED, STERILIZED AND OUTFITTED WITH NEW HYPOALLERGENIC BACKINGS WHEN NECESSARY.SIZE: Earrings drop 3.5" but are very lightweight. Vintage never been worn 1970's enameled metal hoop pierced earrings. 20 to 23mm in diameter. 3 pair. We are not able to make any exceptions to this policy. Various sizes, styles, and conditions included. We will not send a combined invoice unless it is requested. WIDE BANGLE BRACELET V756. SIZE & SHAPE: BANGLE BRACELET 39mm. COLOR: SAPPHIRE. QUANTITY: ONE (1) BRACELET. ~Purchasing Information~. All of the bangles are in various sizes and colors, all need cleaning / restoration. May have scratches etc. but can be polished. Plastic bangles & Duplicate bangles, All types of bangles. Bangles are not in perfect condition. People who buy these kinds of jewelry are familiar with the conditions. I took several images and very close up photos are taken to show you exactly what you will be receiving. Unlike fine jewelry, these kinds of jewelry (handmade tribal jewelry) may have minor flaws here and there. SIZE: 52mm X 37mm -2 PIECE(S) PER LOT- ANT SILVER HIGHLY DETAILED FILIGREE CROSS WITH HOLLOW BACK AND MALLEABLE DESIGN. SILVER OX MOLDS & STAMPINGS. GREAT FOR ALTERED BOOK ART. 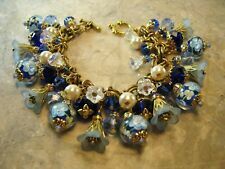 Castlecliff 22" signed double strand graduating crystal necklace. Faceted box clasp wonderful condition. the string is in good condition. Ideal for jewelry making, altered art projects, steampunk accessories or scrap booking. Material: brass. 7/8 in 22mm. 3/4 in 18.5mm. 5/8 in 15mm. 1/2 in 12mm. 3/8 in 9mm. AMAZING DETAILS! This item has been professionally silver plated and oxidized to enhance all of it's fine details. The plating process has been done with high quality materials and processes. The silver plating contains sterling silver which adds to the quality of this piece. CLOSEOUT, straight from a warehouse,have NEVER BEEN WORN !!! Made With Pride In America This beautiful 10kt white gold 16.0" American made necklace looks brand new. This piece has a sleek uniform appearance.It is very smooth to touch. This piece is made to be strong and will hold many different size pendants. A very colorful & unique Kitty! This brooch is made of layered acrylic to achieve the pretty art deco style. Acrylic Cat Brooch. Pink Coral Flower Clasp Silver. Will make into beautiful jewelry !